A state-owned Chinese firm has signed a $558 million deal with the Export-Import Bank of China for the construction of what will be Cambodia’s largest hydropower dam by the time in comes online, according to news reports from China. Bloomberg News reported yesterday that the China Huadian Corp, one of China’s largest electricity producers, signed off on the financing agreement on Friday. Yuon Heng, director for evaluation and incentives at the Cambodian Investment Board, said the government signed the deal for a 338-megawatt hydro-electric plant along the lower Stung Russei Chrum river in Koh Kong province in 2009. Mr Heng said the electricity generated by the dam, the sixth hydropower project to be approved in Cambodia, will be transmitted to Phnom Penh and then sent across the country from there. He could not recall, however, when construction would start or when the plant would go online. The National Assembly approved the project in the final days of 2008. At the time, lawmakers expected construction to start in late 2009 or early 2010 and to last for five years. The agreement guarantees payments to the Chinese firm for 30 years at $0.0735 per kilowatt-hour of electricity. 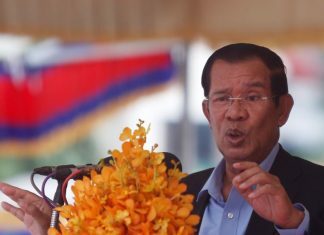 In an October 2008 letter to the assembly, Prime Minister Hun Sen wrote that the Chinese firm would also receive tax-exempt status for the first nine years of operation. Opposition lawmakers criticized the deal for setting too high a price on electricity and offering the Chinese firm overly favorable terms. 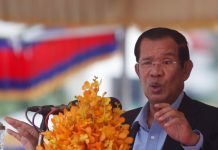 The agreement also commits the Cambodian government to making the necessary payments to the firm in the event either that Electricite du Cambodge, the state utility, cannot pay or of war or political crisis. The dam in one of 11 Chinese-backed hydro-power plants which are either under construction or planning, according to the Ministry of Industry, Mines and Energy. The Cambodian government is banking on these and other dams to cut the country’s electricity prices, one of the highest in the region and widely considered a major hindrance to economic growth. Many of those projects, though, particularly those along the Mekong River, have come under heavy fire for the risks they pose to the environment and to the nation’s fisheries and the large share of the population that derives crucial dietary proteins from the country’s rivers. Some critics insist there’s no way to mitigate the dams’ interruption of fish migration routes. 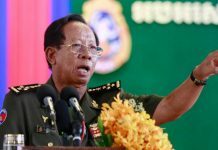 Officials at the Chinese Embassy referred all inquiries to Second Secretary Qian Hai, who said he knew nothing about a dam project in Koh Kong province.